LAS CRUCES, N.M. – The 2014 Western Athletic Conference Tournament Champion New Mexico State men’s basketball team takes on No. 5 San Diego State in Spokane, Wash, Thursday, March 20. The Aggies, who enter the tournament as a No. 13 seed, finished with a 26-9 overall record and an automatic bid for winning the conference tournament. This is the third straight NCAA Tournament appearance, while making the ‘Big Dance’ for the 21st time in program history. Head Coach Marvin Menzies has been a part of four tournament appearances. NM State takes on SDSU, who is ranked 8/7, making its school record fifth consecutive NCAA Tournament appearance, while coming up with a 29-4 overall record and 16-2 Mountain West Conference record. Aztec head coach Steve Fisher will be making his seventh NCAA Tournament appearance while SDSU has gotten in ‘The Dance’ 10 times. The Aggies are led by WAC Player of the Year, Daniel Mullings and WAC Tournament MVP Sim Bhullar. Mullings is averaging 16.8 points and 4.9 rebounds per game and has tallied 64 steals this season. Bhullar is posting 10.3 points and 7.9 boards per contest while coming up with 99 blocks this season. 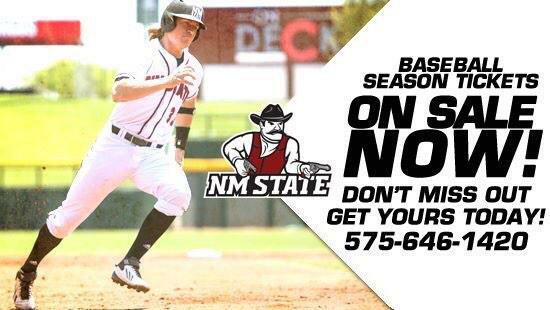 NM State takes on San Diego State at 7:57 p.m. (MT) on TRU TV. Veterans Memorial Arena - Spokane, Wash.